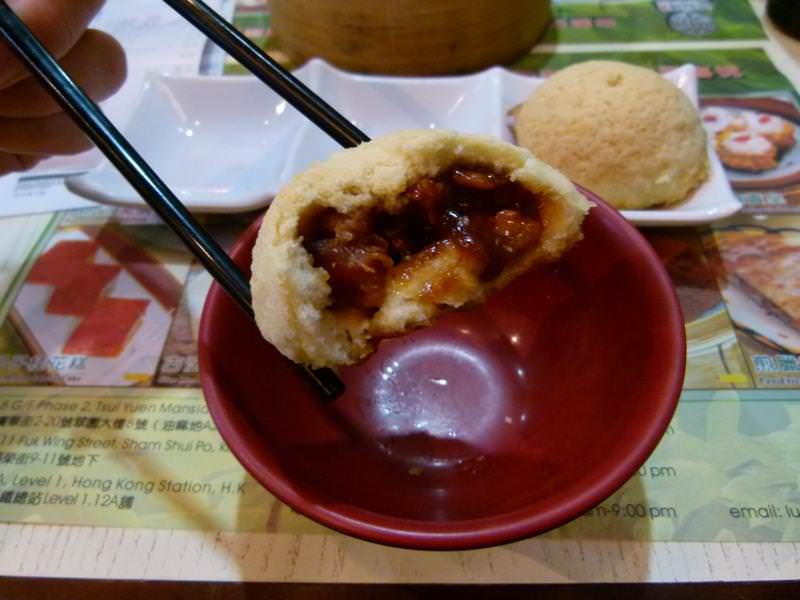 Eating in Hong Kong is a foodie’s dream come true! 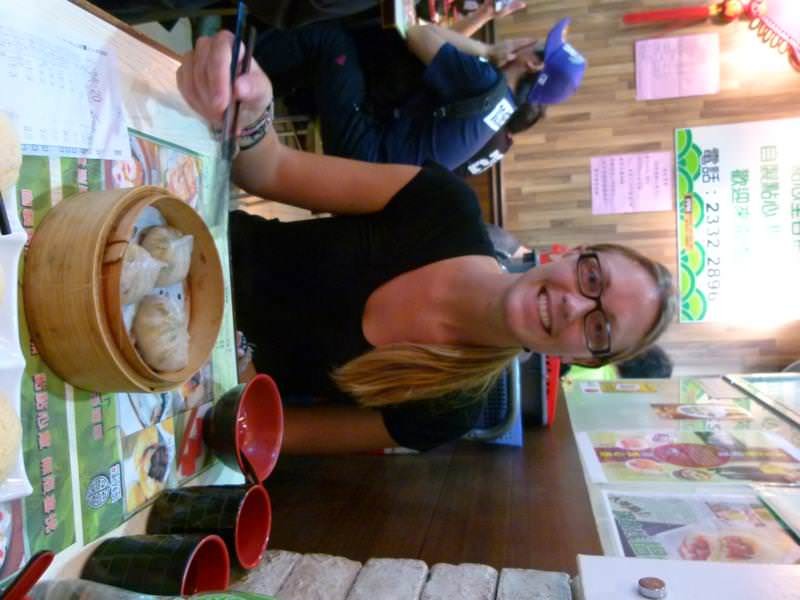 With so many different cultures living in Hong Kong, the cuisine here is amazing. You can eat at Michelin-Starred restaurants, dine at a fabulous sushi restaurant, eat freshly cooked Indian food, enjoy some of the best Italian food, eat from all parts of Asia…or, you could grab a plate of noodles from a street-side vendor. Whether you’re splashing out for a fancy meal or eating on a budget, dining in Hong Kong is a true joy. Woodlands Restaurant (Vegetarian, Indian): This restaurant is tucked inside the Wing On Plaza (17, 62 Mody Rd., Tsim Sha Tsui) and at first glance it doesn’t look very appealing. However, once you sit down and try the freshly made curries, you will be glad you gave it a chance! It’s packed with Hong Kongers, Indians & foreigners on any given night. The menu has great variety. The Southern and Northern all-you-can-eat thalis come with rice, 3 curries, pappadum, puri/chapatti, sambar, dessert & curd….they’re amazing and cost 77hkd. The dosas are massive and cost 45-55hkd. It’s not cheap, but it definitely doesn’t blow the backpacker’s budget. Paisano’s Pizzeria: This New York style pizza & pasta chain is found all over the city. They serve really good Italian food; everything from calzones, pastas, salads, sub sandwiches and pizzas (by the slice as well). 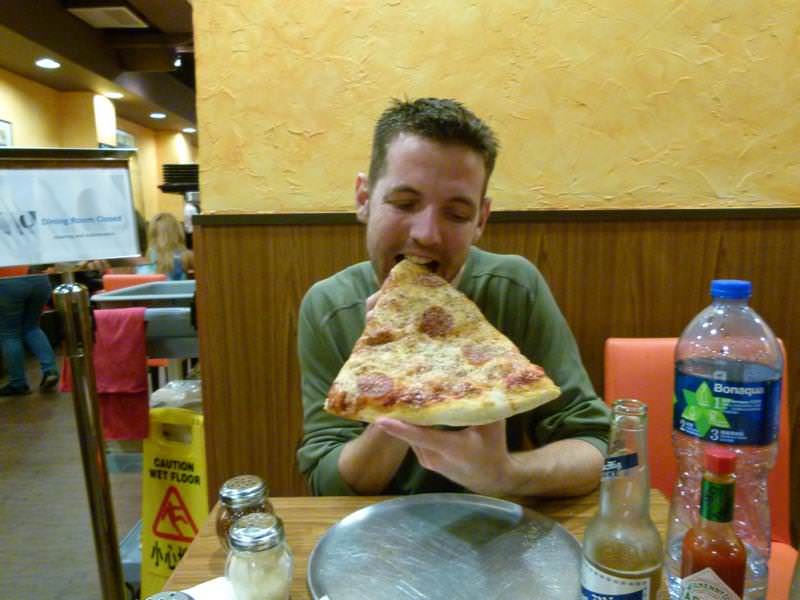 We went there for the lunch special – a MASSIVE slice of pizza with a beer for 45hkd. On any given day, they have their slices of pizza with one topping for 35hkd, or a slice of cheese pizza for 25hkd. If you decide to combine a salad, pasta, pizza, dessert, etc. make sure to ask if they have any specials, they usually do but don’t list them on the board. This is a good choice for budget backpackers. Roccos Pizzeria (66 Mody Road, Tsim Sha Tsui – 852 2369 8981): This is a more upscale Italian place to eat. They have a lunch special with a salmon or chicken pasta and salad bar for 89hkd. They also serve lamb, salmon, beef, pizzas, many pastas, appetizers and salads. Happy hour is between 12:30pm & 8:00pm, with beers & wine 2-for-1. Meals here are between 100hkd and 200hkd. 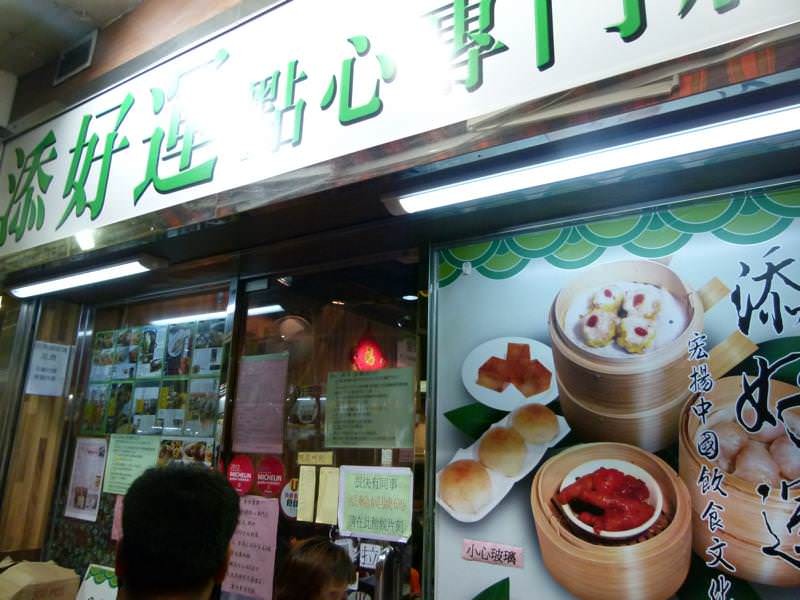 Tim Ho Wan (8, 2-20 Kwong Wa St. Mong Kok): This is the world’s cheapest Michelin-Starred place to eat! The chef here is a former Four Seasons chef and serves up delicious dim sum. The place is packed and is lined up outside the door most nights. Meals cost between 30hkd and 50hkd. Subway Sandwiches: this is a great option for budget travellers. Go for the “sub of the day” which costs 21hkd for a 6 inch sub. Tuesdays are 2-for-1 subs after 3:00! Side-Of-The-Road Noodle Stalls: Tucked down quieter streets you’ll find family run noodle stalls serving up soups, fried noodles, rice dishes and dumplings. Delicious and cheap. 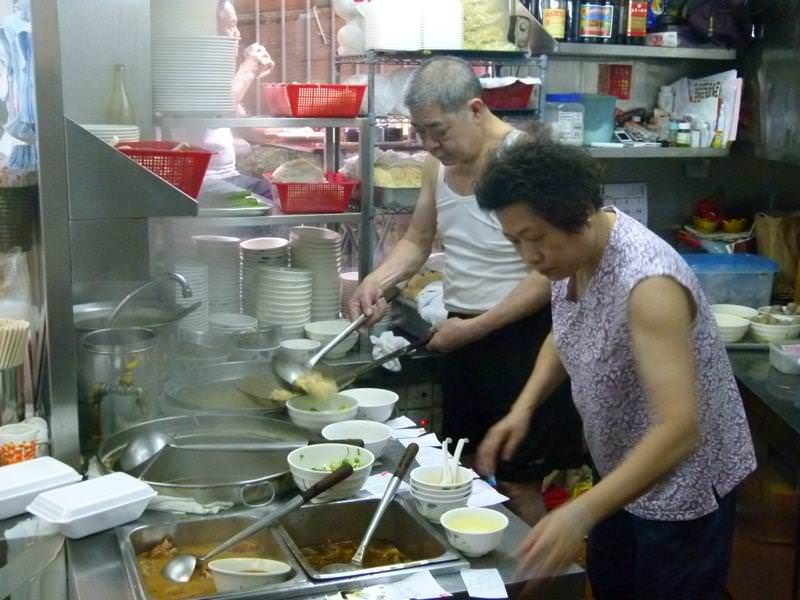 Ma & Pa cooking up some delicious noodles for our lunch in Hong Kong. McDonald’s: Ok, so it’s not authentic, nor is it healthy eating, but unfortunately McDonald’s is one of the cheapest places you can eat in Hong Kong! They have bagels and muffins which aren’t so bad for breakfast. There are many supermarkets all over the city for self-catering. Marketplace & International are located in the Kowloon area. Here you can find lots of imported goods and wines. 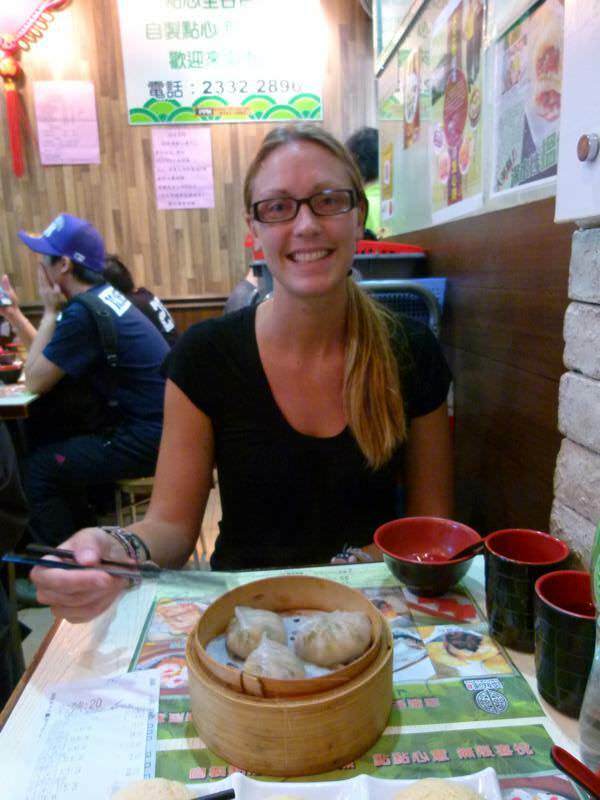 Wherever you choose to eat in Hong Kong, you won’t be disappointed! The variety of food is great and everything is delicious. Enjoy. Nice article! I’m visiting HK next week. This post is very helpful. Tim Ho Wan at 8, 2-20 Kwong Wa St. Mong Kok is now permanently closed.